When you’ve got rail-riding hobos, nattily dressed Flair-wolves and feral Vagrats (giant bipedal rats down on their luck) beating down your door, who ya gonna call? The Startling Developments detective agency, that’s who. Adventurers and occultists Jonathan Gabriel and Tycho Brahe are the Sherlock and Watson-style alter-egos to the webcomic favorites of the same name. For the agency’s third outing, Penny Arcade creators Jerry Holkins and Mike Krahulik have teamed up with 16-bit enthusiasts Zeboyd Games to create a tactically minded, lovingly rendered tribute to SNES-era RPGs, built around PA’s particular brand of hyper verbal, off-kilter comedy. If you’ve never played a Zeboyd title, they do for top-down RPGs what Shaun of the Dead and Hot Fuzz did for zombie and buddy cop movies. Rain-Slick 3 both lampoons old-school Final Fantasy-type RPGs and offers an admirable re-creation of the turn-based, four-character style. With its blocky aesthetic and excitable midi soundtrack, it could be mistaken for an early-90s release – upon first glance, at least. The telling, tongue-in-cheek plot points – like going up against the Evil King (that’s his real name: Evil Bartholomew King) at the behest of the Good King, or pursuing the nefarious Dr. Blood – hilariously blow the game’s cover. However, fans of Chrono Trigger and the like who just want a meaty tactical experience, or a straightforward story, might find the game’s wordiness tiring. Make no mistake though, players with a head for turn-based role-playing will find plenty to dig into. 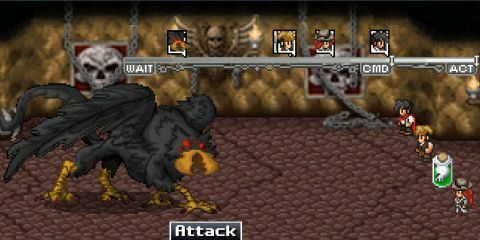 The game’s class pin system allows each character to use three sets of abilities. Each has a base class and two additional combat roles that can be assigned. Giving the fisticuff-favoring Gabriel (the Brute class) the Tube Samurai class pin allows him to build extra strength and speed using battle stances. We found a favorite tactic in using our mage-like character Moira to unleash Rat Swarm, which inflicts Hoboism, bringing with it social disenfranchisement and upward of a hundred damage per round. Following it up with Bumfight made short work of most foes. Dense portions of dialog and exposition reminded us of less-than-favorable moments of the top-down era. We were often tempted to skip vast chunks of conversation, wanting to get on with things but wondering if we’d miss something important. The game does suffer from a moment or two of poor pacing, like when we had to make our way through a haunted house, twice, fighting each ghost again. Just like back in the day, approaching an enemy begins a battle, and things are intentionally laid out so that skipping a fight is rarely an option. Make no mistake, PA’s signature comedic style is a boon to the game. It’s just at its best when it’s in digestible chunks. We often laughed out loud at enemy names, types of attacks and item descriptions. Two of our favorites: a “Magic” Ring whose level of magic bonus was “so small it’s almost insulting,” and a time traveling, tuxedo-wearing Epochosaurus (“nobody knows what his deal is”). Fans of the webcomic will recognize him, along with series regulars like the Deep Crow and those insidious Merch creatures. We half expected the infamous Paul Christoforo, of the Ocean Marketing fiasco, to make a cameo appearance. Wordiness aside, the game is high on charm. Writer Holkins and the game’s artists imbue the characters with chemistry, making their interactions come to life with just text and lightly animated character portraits. They even manage to give Gabe a rapport with Jim, a skull floating in a jar, whose only means of communication are emitting gurgles and strange smells. Rain-Slick 3 is a lovingly well-made, if niche product. Your enjoyment of it can be gauged by the answers to two questions: Do you like old-school RPGs? Do you like Penny-Arcade? If you answered yes to both, this game was made for you. Of course, if that’s the case, you probably didn’t need a review to point you in the direction of this title. The game is also a mere $5, so if you’re craving some gaming nostalgia circa 1995, but don’t feel like yet another trek through Earthbound or Phantasy Star IV, Rain-Slick 3 is an easy choice for anyone with an appreciation for turn-based combat and a good Cthulhu reference. This game was reviewed on PC as the lead platform. Description The third outing for Gabe and Tycho's Startling Developments detective agency is sporting a top-down, 16 bit look.